When I can, I enjoy communicating science to the general public. Some of my recent outreach work is listed here. SETI Institute Colloquium Series speaker (Mountain View, CA, 2016). A recording of this talk is available on my 'about' page. SPICE Travelling Scientist (Western Australia, 2013) - an article about this outreach event can be found here. 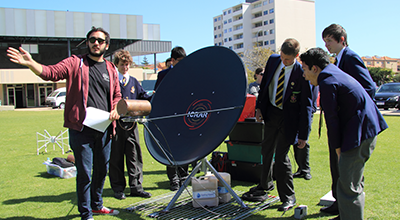 Helping pupils at Christchurch Grammar School build their very own tiny radio telescope!